Time for another new Pyro Tutorial about Xbee communication! Xbee are small modules that use the Zigbee standard for wireless communication and offer a lot of flexibility as well as reliability with wifi communication. 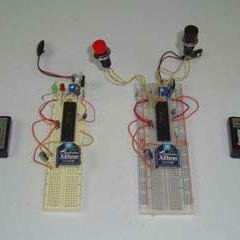 This tutorial shows you how to make a simple wireless Input/Output system with two PICs. I have work out the tutorials: Wireless communication over IR and Wireless interface RF modules. It works very well. Now I try out the tutorial: Intro to Xbee, build a Xbee wireless interface. Here i have a problem.I have progammed the transmitter (PIC18F4520I/P) and receiver (PIC18F4520I/P)with the Pickit2 and MPLAB. I have build the transmitter circuit and the receiver circuit on breadboards as suggested in the article (circuits), but it does’nt work. In the article you decribe under schematic specifics – Transmitter circuit: “”PORTB pin 0 is connected to the Xbee Din pin”” similarly for the receiver circuit.I don’t understand this, i don’t see this connections in the transmitter and receiver circuit! Can you help me for a solution?